Today I will begin painting the candy-coated peanuts. Yum! As the colors are layered onto these little morsels, they will come to life!!! First, it is important to understand that if I want to achieve nice dark shadow areas I will have to use relative opposites of colors as underglazes in the shadow areas. Painting a layer of the near-opposite of a color will create a deeper shade of the local color and give the impression of a very dark shadow, and thus provide the illusion of dimension! The relative opposite of the blue in my candy might be Burnt Sienna, so that is what I will use for the shadows in the blue candy. I have decided to change a few of the colors of the candy, to balance things better, so if you do the same, make a mark on your reference photo to help keep things straight. I am using a coffee-stain of Burnt Sienna to create transparent areas of color where the shadow shapes are. Pay attention to crisp and soft edges. The crisp edges will be painted on the dry paper and left alone. The soft edges will be touched gently with a clean, damp brush. The touching with clean water will soften the edges and make the objects look more dimensional. Allow the Burnt Sienna to dry. 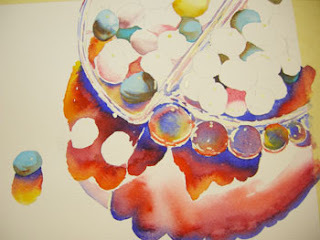 Now use a blue or turquoise color from your palette to glaze over the dried "blue" candies. Paint over the entire candy piece, including the shadow area. Keep this glaze very transparent and wet. Allow this to dry thoroughly. I have gone back to my shadow colors and used the "charging" technique previously used for the shadow areas to develop the under-parts of the candy dish. Notice the application of paint around and under the candy.